Front Page > Pets Section > Avoiding Aches & Pains While Walking Your Dog! Whether you have a big dog or a small dog, there's one thing we all have to do everyday - and that's go walkies! But if your dog likes to pull on the lead, wants a stick thrown for them every 5 minutes or is a determined sniffer that's prone to sudden stopping, then a dog walk is not always good for your back! Here James Forrester-Wood from the Swindon Chiropractic Clinic provides some key tips on avoiding the aches and pains that can creep in or made worse when you're out walking your four-legged friend. Getting out into the fresh air and taking the dog for a walk is a very good form of exercise. However, what starts off as some "good for you" gentle exercise can leave you feeling a little sore and even injured! A common complaint related to dog walking, is shoulder, neck and arm pain. This often results when the dog is on the lead, starts to get excited, and pulls in the direction in which they wish to go. The dog walker will naturally try and regain control by pulling against the lead; this can cause a significant increase in pressure on the upper back, neck and shoulder. As the majority of dogs are not perfectly behaved 100% of the time this can lead up to a build up of tension. To prevent this from happening it is wise to undertake a few gentle warm up exercises. Start off by stretching the neck and shoulders; this can be done with circular arm rotations on both sides. Have a gentle stretch of the hamstrings and quadriceps. Consideration of what equipment to use will also help protect your back. The best equipment to use would be a halti, collar and double lead. The halti is designed to close the dog’s mouth if they pull to hard. The double lead attaches to the halti and the dogs collar, and this is the most effective and comfortable way of controlling the dog. However, the training that is done with the dog is also very important. It is beneficial to regularly train the dog to recall, using rewards to gain attention and obedience. This will help to reduce the times when the dog is distracted by other dogs or things, and gives the walker a greater degree of control. Dog training is a fun way to exercise the dog. Throwing a ball is not an Olympic sport! Another common complaint that dog owners can experience is neck, back and shoulder pain resulting from throwing a ball or stick repetitively. Throwing sticks (where the stick is used as an extra leaver to launch the ball) are great in reducing the amount of strain needed to throw the ball. Another important thing to remember is that the dog walker is not in an Olympic ball throwing competition, the dog will not complain if the ball or stick is thrown a little shorter than usual. Again, warming up as previously described can help! 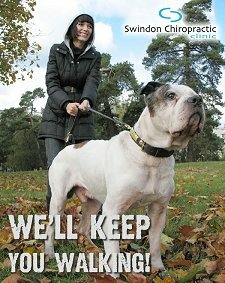 So, to avoid an unnecessary trip to one of our Chiropractors at Swindon Chiropractic Clinic, warm up your upper body before taking your dog for a walk! James Forrester-Wood is one of the longest serving associates at the Swindon Chiropractic Clinic, who have treated over 25,000 people since opening in 1982. They offer a safe, effective hands-on treatment which gets straight to the cause of the pain. 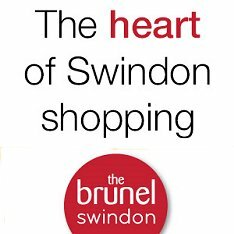 Now they've brought all their valuable, expert advice on video together in one place - SwindonChiroTV. Just click on the link to find to watch more advice on avoiding and how they can help with neck & back pain, sports injuries and work-related joint problems.